What Does Your Cell Phone Say About You? We came across this article from Venture Beat about security software firm Avast, who recently purchased 20 smartphones from eBay. The company purchased them to test what data remained on the “wiped” phones. In addition to a completed loan application, Avast found 250 names and addresses, 40,000 photos (including the, ah, types of photos that may be considered embarrassing at best), 750 texts and emails, and a whole lot more. The one phone that had security software loaded on it is the one that gave up some of the most sensitive data. Not only was Avast able to access the previous owner’s Facebook page, find the names and numbers of his closest contacts, a “penchant for kink and a completed copy of a Sexual Harassment course,” they were able to figure out where he’d been using his GPS coordinates. That’s a lot to know about somebody from a phone that was supposedly protected. Avast’s experiment to raise awareness about how insecure mobile phones are was an obvious success. So, what can you do to protect the data on your phone? Be sure to only give obsolete phones and other data-containing devices to a certified data destruction and electronics recycling company who will guarantee that if the phone is re-purposed, all data will have been destroyed. Or, if you prefer, shred it. When choosing to shred old cell phones and other small devices, ask about the shredding technology. Solid State Drives (SSDs), flash drives, smart phones and micro SD cards will literally fall through the cracks of most data destruction and recycling processes. 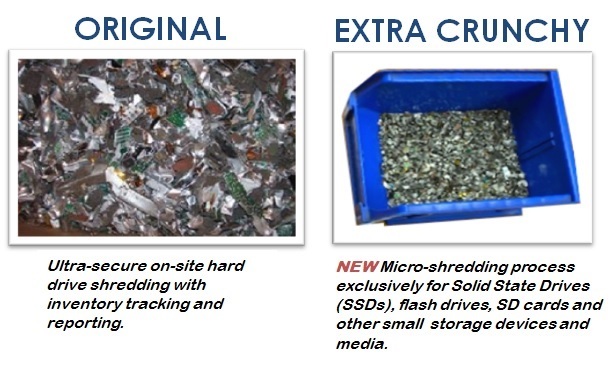 Be sure to ask for the “micro-shredding” option that goes beyond traditional shredding and pulverizes devices into 2mm e-crumbs as shown in the photo on the right.